European settlers to America brought with them their favorite fruits which were much better than the native crab apple. 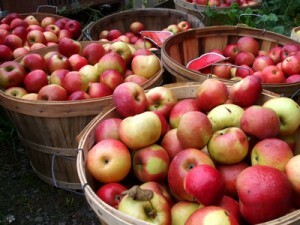 The colonists used apples to eat, make cider, vinegar and hard cider. As the colonists explored the frontier and moved from east to west, the apple went with them. Now the apple is grown commercially in 36 states. There are 7,500 different apple varieties, 2,500 grown in the US. Washington, New York, Michigan, California, Pennsylvania and Virginia are the top apple growing states. Thanks to Mott’s for this info!